I’ve been thinking: It’s time to take App-Smashing to the next level. I submit for your consideration, G-App Smashing. 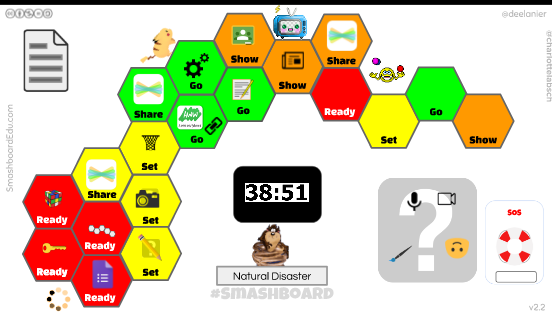 G-App Smashing (verb): Combining a game activity with a non-game app to create sheer awesomeness. Edtech is brimming with apps. Just as we gamified teachers twist everyday materials around us into games, why not do the same with apps? I took another look at some of my favorite apps and reimagined them: How could they be used as a game or game-based activity? Another game-based use for Flipgrid is using it for a showcase following game-creation projects or game-jams. Demonstrating their game and gameplay through Flipgrid can provide a wonderful channel for parents and the community to see into the classroom. Padlet: The column layout on Padlet provides a great place for modifying listing games, like Scattergories. Each team could list words or ideas in their column, but only if no other team has used it. Tisha Richmond @tishrich used a column Padlet at the Summer Spark conference for structured game brainstorming. The first column was theme, and participants suggested theme ideas; then the second column was “setting,” the third “characters,” and so on. This format can provide structure to game planning for both teachers and students. Popplet: The app is all about connections, so it’s perfect for students to illustrate their understanding of connections in their learning. In a two-person game, one starts a bubble with a key concept (osmosis, impressionist movement, monopolies) and the next must add a new connecting bubble with an image of that concept. Then the second player must start a third bubble that connects to either the first or second bubble. Of course, Popplet could be used to mindmap ideas for games, too. I’ve had some students who think better with this format than linear ones. Google Slides: If it’s possible to have a favorite Google app, then mine would be slides. There’s so much flexibility to this app, it’s ridiculous. One of my new favorite game-inspired ways to use slides is Dee Lanier’s Smashboards! Use one of Dee’s templates or create your own game-board-like slide to create a quest-based way to teach problem solving! This concept gives me so many ideas it makes my head spin. Google Drawing: Two words: Digital Manipulatives! Let’s face it, making manipulatives can be time consuming, but not if you use Google Drawing! Create manipulatives of concepts, vocabulary, whatever, and allow students to sort and classify them. Another idea comes from Kasey Bell, who used Google Drawing to create Magnetic Poetry. I’m sure I haven’t scratched the surface. Since I’m 1:1 Chromebooks, I’ve no doubt that there are dozens of iPad apps that I haven’t even considered. But next time you’re using some of those non-game apps, stop and consider: How can I game this up?